Transparency is important to us. And so is inclusion. Which means you’re part of the Coffee Circle story too. We’d like to show you how we’ve developed since we started in 2010 and what we’ve achieved so far with our trading model. The value chain in coffee is complex so we’ve tried to lay it out in an understandable way. 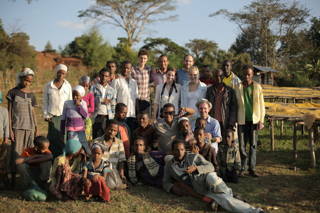 We’ve presented our sourcing structure in Ethiopia, using the example of our largest partner, the Ilketunjo cooperative. Coffee Circle was founded in 2010. What's happened since then? Through direct trade and above-average purchase prices, so far we have reached 121,000 people in the coffee growing regions. With every cup of coffee you support the people in the coffee regions. € 1 per sold kg of coffee goes 100 % into the projects. With each cup of coffee you have generated more than 475,000 € in donations. The projects we financed have improved the lives of more than 36,000 people. Thank you! 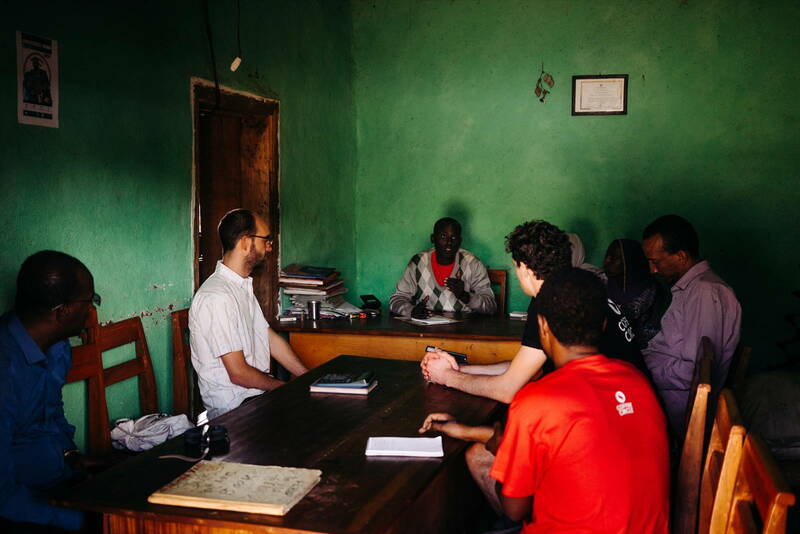 Using the cooperative as an example, we’d like to show you how the value chain in Ethiopia is structured. 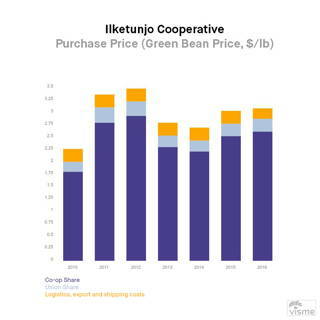 The cooperative Ilketunjo is the home base for our Limu coffee. Since the foundation of Coffee Circle we have bought coffee there every year. The total purchasing volume over the years is currently 96,000 kg, which makes Ilketunjo our largest source of coffee. The coffee farmer receives his income from the cooperative. However, some of the funds remain within the cooperative to finance new machines and repairs and to cover running costs. The cooperative is a democratically structured association of coffee farmers. The Union is the umbrella exporter organisation of several cooperatives, which enter into contracts with international coffee traders and prepare the export of coffee. The percentage that the Union receives varies, usually between 10 and 30 %. FOB cost (Free on Board) means the costs up to the agreed port of loading of the shipment. An importer is the official contractual partner of the Union, which is responsible for shipping, customs clearance and storage. The Green Bean Price consists of FOB, as well as costs for logistics, export service, shipping and storage. We know many of the coffee farmers personally and are active in the region with our projects. 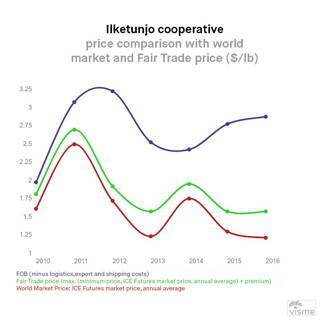 In the following we break down the purchase prices of the cooperative Ilketunjo over the years and compare them with world market and fair trade prices of corresponding coffees. On average, the purchase price we pay in Ilketunjo is 92 % higher than the world market price and 56 % higher than the fair trade price.